Indiaplaza Blog For smart shoppers |: Jeffrey Archer is back with "And Thereby Hangs a Tale"
Jeffrey Archer is back with "And Thereby Hangs a Tale"
Archer's sixth collection of enthralling short stories takes inspiration from around the world and will be available in May from Macmillan. Exclusive Indiaplaza Offer: Now you can pre-order "And Thereby Hangs a Tale" by Jeffry Archer @ 30% discount! Millions of readers around the world have relished Jeffrey Archer's short stories. Taking inspiration from his favorite short story writers - F. Scott Fitzgerald, Maupassant, H. H. Munro, W. Somerset Maugham and O. Henry - Jeffrey Archer has written five bestselling collections over the years and Macmillan are proud to announce the publication of a sixth volume of stories in May 2010. Jeffrey has a natural aptitude for short stories which are stylish, witty and entertaining. His mastery of characterization and suspense, combined with a gift for the unexpected, jaw-dropping plot twist, show him at the height of his powers and demonstrate why he is one of Britain's best-selling authors. All of Jeffrey's collections of short stories have been top ten bestsellers and he is undoubtedly the bestselling English-language short story writer of our times. 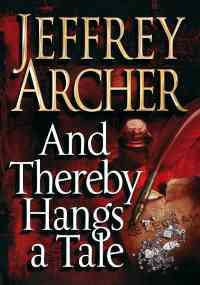 Exclusive Indiaplaza Offer: Now you can pre-order "And Thereby Hangs a Tale" by Jeffry Archer @ 30% discount! !